Russia and China are planning a transition to making trade settlements in roubles and yuan, according to a statement Russian President Vladimir Putin made at the recent Asia-Pacific Economic Cooperation (APEC) summit in Beijing. The move is intended to reduce the U.S. dollar’s influence on the global energy market. Shortly after Putin made the announcement, Russia’s largest bank — state retail banking giant Sberbank — began financing letters of credit in Chinese yuan and performed the first transactions in yuan with one of Russia’s largest companies. The decision is just the latest move in increased cooperation between Russia and China. While Russia has long talked about the possibility of a pivot toward Asia, the country’s increasing isolation from Western countries has proved an important catalyst in the process. Analysts say that both Russia and China will profit from closer ties, and the currency agreement is one indication. Bedenkov added that this kind of currency diversification is especially important for Russia because of the financial sanctions currently imposed against it by the European Union and the United States which is preventing Russian banks from borrowing money to refinance their debt. Alexander Dorofeev, general director of the consulting company Arkaim, said the plan to gradually transition to settlements in national currencies was entirely realistic. “This has already been under way for several years because there are serious forces in the global financial elite that are interested in it,” Dorofeev said. Yet Dorofeev added that the United States had a vested interest in preventing this transition, as it wants to preserve the dollar’s status as the primary global currency and the unit for international business transactions. 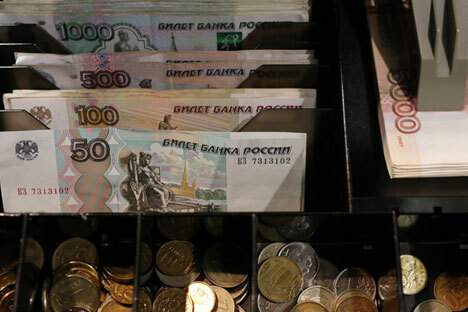 “How this confrontation goes will depend on the speed of the transition, but the U.S.’s ability to lobby for payments in dollars everywhere is on the decline,” said Dorofeev. According to him, Putin is the only world leader really promoting trades in national currencies, despite the fact that this process is already under way. The rouble-yuan pair has been traded on the Moscow and Shanghai stock exchanges since December 2010. China has restrictions in place, however, on foreign exchange operations for Russian companies in yuan. In September, Russian Deputy Finance Minister Alexei Moiseev indicated that Russia was interested in expanding the level of cooperation, saying that Russia and China could start paying for half of their trade in yuan and roubles if China were to lift those restrictions. Large Russian companies have been working actively with the Chinese currency for some time. Vladimir Potanin, C.E.O. and co-owner of the world’s largest nickel producer, Norilsk Nickel, heads one of these. “So far, we have converted some of our free funds into Asian currencies, for example, the Hong Kong dollar and yuan,” Potanin told RIR in an interview in September. According to Russ-Invest’s Bedenkov, trade between Russia and China is not yet enough for Russia to ignore the demands of its European partners. Russian-Chinese trade totalled $89 billion in 2013 and $43 billion in the first half of 2014. At the same time, trade with the European Union reached $413 billion in 2013 — roughly half of Russia’s total trade. “It’s worth noting that trade is increasing. Russian exports to China accounted for 10 percent of the former’s total trade in the first half of 2014 and reached $19 billion,” said Bedenkov. The recent APEC summit may end up being a turning point in Russia-China cooperation. The centrepiece of this idea is the creation of the Asian Infrastructural Investment Bank and a fund to finance infrastructure development for the Great Silk Road Economic Belt. These institutions, if created, could challenge the current global financial system, according to Alexander Dorofeev. “One of the intrigues of the summit is whether or not we’ll see changes to the rules of how the International Monetary Fund works,” he said. Alexei Kozlov, chief analyst at investment company UFS, agrees that the recent summits underscore the developing relationship between Russia and China. “The APEC and G20 summits confirmed that there is a cooling trend in Russia-West relations and a drawing together of Russia and China,” said Kozlov, noting that Putin and Chinese President Xi Jinping have already met five times this year. Roman Andreeshchev, a professor at the Russian Presidential Academy of National Economy and Public Administration, shares Kozlov’s perspective. “Europe and the U.S. have already been trying to bring China to their side for quite some time, and China has not yet issued its judgment. The U.S. and China have very strong economic ties, and China’s behaviour essentially demonstrates a lack of support for the Western position and an endorsement of how Russia is acting in the global arena,” Andreeshchev said.